Ohio State is one of college football’s most dominant programs and have produced some of the NFL’s best talent. There are currently two young players from Ohio State on the Broncos’ roster — cornerback Bradley Roby and tight end Jeff Heuerman — and both are expected to have important roles this season. With 11 more players from OSU entering the NFL draft this year, there will be plenty of talent for the Broncos to look at — and potentially add another Buckeye to their roster. Ward was a dominant corner through his college career and was selected as a first-team All-American and an All-Big Ten Conference player in 2017 after finishing the season with 37 total tackles, 15 passes defended and two interceptions, all while battling against other teams’ best wide receivers. 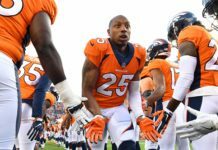 The Broncos’ Roby will see an increased role this season; with Aqib Talib gone, Roby is expected to start opposite three-time Pro Bowler Chris Harris Jr..While the Broncos have two talented corners, there is quite bit of a drop-off in experience and talent after that. Ward is projected to be a first-round pick, and should be in play for the Broncos, who select fifth. Although he still possesses room to build and grow stronger, the 5’11” Ward would be the tallest corner on the team and just a few pounds shy of the heaviest — but he’d also be the fastest player on the entire Broncos’ roster; Ward ran a head-turning 4.32 seconds in the 40-yard dash at the NFL combine, the fastest time of the entire 2018 combine. 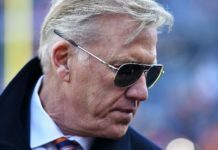 Ward would be a terrific addition immediately, and could eventually become a Pro Bowler himself and offset the loss of Talib. While they’re aren’t any players worthy of the No. 5 overall pick at the position, the Broncos need production out of the tight end position; production they had hoped to receive from 2015 third-round pick and former Buckeye Jeff Heuerman, who missed all of his first season with a torn ACL and also missed a handful of weeks between the 2016 and 2017 seasons with lingering injuries. In his fourth and final year of his rookie contract, Heuerman is going to need to stay healthy, and Schlegel thinks he can do so. “Jeff is a big, physical dude. 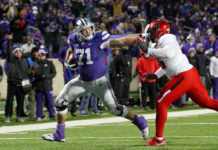 He’s not going to have blazing speed and run over guys… but understanding where he fits — being able to block on the edge or get a mismatch on a linebacker,” could be a key piece for an offense that struggled mightily last season. Click here to listen to the full interview with Anthony Schlegel, including more about Ward, Roby, and Heuerman, as well as thoughts on Baker Mayfield and how important training camp is for players.